My view? Blue eyed blonde haired Jesus is an impossibility. Jesus, by the Bible was a middle eastern Jew, meaning he would look like the locals. From the first time Christian children settle into Sunday school classrooms, an image of Jesus Christ is etched into their minds. In North America he is most often depicted as being taller than his disciples, lean, with long, flowing, light brown hair, fair skin and light-colored eyes. Familiar though this image may be, it is inherently flawed. A person with these features and physical bearing would have looked very different from everyone else in the region where Jesus lived and ministered. Surely the authors of the Bible would have mentioned so stark a contrast. On the contrary, according to the Gospel of Matthew, when Jesus was arrested in the garden of Gethsemane before the Crucifixion, Judas Iscariot had to indicate to the soldiers whom Jesus was because they could not tell him apart from his disciples. Further clouding the question of what Jesus looked like is the simple fact that nowhere in the New Testament is Jesus described, nor have any drawings of him ever been uncovered. There is the additional problem of having neither a skeleton nor other bodily remains to probe for DNA. In the absence of evidence, our images of Jesus have been left to the imagination of artists. The influences of the artists’ cultures and traditions can be profound, observes Carlos F. Cardoza-Orlandi, associate professor of world Christianity at Columbia Theological Seminary in Atlanta. 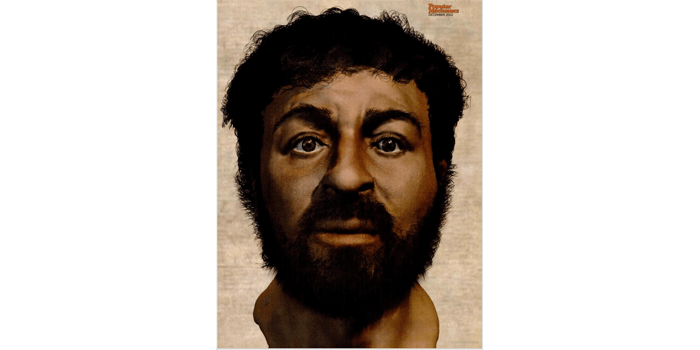 “While Western imagery is dominant, in other parts of the world he is often shown as black, Arab or Hispanic.” And so the fundamental question remains: What did Jesus look like? An outgrowth of physical anthropology, forensic anthropology uses cultural and archeological data as well as the physical and biological sciences to study different groups of people, explains A. Midori Albert, a professor who teaches forensic anthropology at the University of North Carolina at Wilmington. Experts in this highly specialized field require a working knowledge of genetics, and human growth and development. In their research they also draw from the fields of primatology, paleoanthropology (the study of primate and human evolution) and human osteology (the study of the skeleton). Even seemingly distant fields like nutrition, dentistry and climate adaptation play a role in this type of investigation. While forensic anthropology is usually used to solve crimes, Richard Neave, a medical artist retired from The University of Manchester in England, realized it also could shed light on the appearance of Jesus. The co-author of Making Faces: Using Forensic And Archaeological Evidence, Neave had ventured in controversial areas before. Over the past two decades, he had reconstructed dozens of famous faces, including Philip II of Macedonia, the father of Alexander the Great, and King Midas of Phrygia. If anyone could create an accurate portrait of Jesus, it would be Neave. Matthew’s description of the events in Gethsemane offers an obvious clue to the face of Jesus. It is clear that his features were typical of Galilean Semites of his era. And so the first step for Neave and his research team was to acquire skulls from near Jerusalem, the region where Jesus lived and preached. Semite skulls of this type had previously been found by Israeli archeology experts, who shared them with Neave. With three well-preserved specimens from the time of Jesus in hand, Neave used computerized tomography to create X-ray “slices” of the skulls, thus revealing minute details about each one’s structure. Special computer programs then evaluated reams of information about known measurements of the thickness of soft tissue at key areas on human faces. This made it possible to re-create the muscles and skin overlying a representative Semite skull. The entire process was accomplished using software that verified the results with anthropological data. From this data, the researchers built a digital 3D reconstruction of the face. Next, they created a cast of the skull. Layers of clay matching the thickness of facial tissues specified by the computer program were then applied, along with simulated skin. The nose, lips and eyelids were then modeled to follow the shape determined by the underlying muscles. Two key factors could not be determined from the skull—Jesus’s hair and coloration. To fill in these parts of the picture, Neave’s team turned to drawings found at various archeological sites, dated to the first century. Drawn before the Bible was compiled, they held crucial clues that enabled the researchers to determine that Jesus had dark rather than light-colored eyes. They also pointed out that in keeping with Jewish tradition, he was bearded as well. It was the Bible, however, that resolved the question of the length of Jesus’s hair. While most religious artists have put long hair on Christ, most biblical scholars believe that it was probably short with tight curls. This assumption, however, contradicted what many believe to be the most authentic depiction: the face seen in the image on the famous—some say infamous—Shroud of Turin. The shroud is believed by many to be the cloth in which Jesus’s body was wrapped after his death. Although there is a difference of opinion as to whether the shroud is genuine, it clearly depicts a figure with long hair. Those who criticize the shroud’s legitimacy point to 1 Corinthians, one of the many New Testament books the apostle Paul is credited with writing. In one chapter he mentions having seen Jesus—then later describes long hair on a man as disgraceful. Would Paul have written “If a man has long hair, it is a disgrace to him” if Jesus Christ had had long hair? For Neave and his team this settled the issue. Jesus, as drawings from the first century depict, would have had short hair, appropriate to men of the time. George Zimmerman’s DNA was the only one that could be identified on the grip of the gun used to fatally shoot 17-year-old Trayvon Martin, according to forensic tests made public Wednesday. The resuts rule out Martin’s DNA from being on the gun’s grip. Zimmerman’s DNA also was identified on the gun’s holster. The tests were inconclusive as to whether Martin’s DNA was on the gun’s holster. Zimmerman says Martin was on top of him, slamming his head against the ground when he grabbed his gun from a holster before Martin could get it. Other records being released today include a photo of Zimmerman’s head that was taken by a witness following a confrontation with Martin.